Former Fulham star Leroy Rosenior on Thursday believes Nigeria international Alex Iwobi can get even better for Arsenal as he continues his impressive start to life under the management of new head coach Unai Emery. Rosenior was reacting to a mail from an Arsenal fan on Premier League Fan Zone who said the Nigerian has been the Gunners' best player so far this season. "Iwobi has been impressive since Wenger left. He's been an enigma," Rosenior who also played for West Ham United and Queens Park Rangers noted. "I think the new contract has made him more focused and if given new direction, Iwobi can even be better for Arsenal," the former Premier League player who is now a pundit and coach opined. 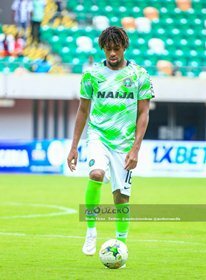 Iwobi barring any injuries in Arsenal's games against Sporting Lisbon (Europa League) and Wolves (Premier League) will be in Nigeria's squad for the 2019 Africa Cup of Nations qualifier against South Africa on Saturday, November 17 at the FNB Stadium in Johannesburg.